says the Global Carbon Project. But no sign of a leveling off in atmospheric concentrations. The world is heading for catastrophic climate change. The fifth assessment report of the Intergovernmental Panel on Climate Change (IPCC AR5) in 2013 was the first to include an assessment of a “carbon budget” – a finite amount of carbon that can be burnt before it becomes unlikely we can avoid more than 2°C of global warming. Later they issued a budget for 1.5°C, which Carbon Brief updated in Six years worth of current emissions would blow the carbon budget for 1.5 degrees. “It will take just six years of current emissions to exhaust a carbon budget that would give a good chance of keeping global warming below 1.5 degrees Celsius, based on figures from the Intergovernmental Panel on Climate Change (IPCC). The IPCC’s new budget, revealed earlier this month, calculates the remaining amount of carbon dioxide humans can emit and still hope to cap global warming at less than 1.5 degrees Celsius above pre-industrial levels. Carbon Brief’s updated figure for the IPCC’s remaining carbon budget is 243 billion tonnes of CO2, with counting starting in 2015. Dividing this budget by the population of the world gives 33 tonnes per person. To keep within 2°C the budget is 115 tonnes. In Is Green Growth a Fantasy?, I accepted the assumption that in the second half of this century, the world will be able to extract enough carbon from the atmosphere to balance emissions. This meant the remaining carbon budget of 115 tonnes CO2e must be eked out until this “carbon extraction safety zone” is reached. That is when carbon extraction balances carbon emissions. 1 The models used by IPCC AR5 (the CMIP5 models) gave optimistic estimates of the budgets. 2 The proposed carbon extraction may not work soon enough at the scale required. 3 Should we aim at 1.5°C or 2°C? Is 2°C safe? 4 Individual carbon footprints differ from the average footprint. 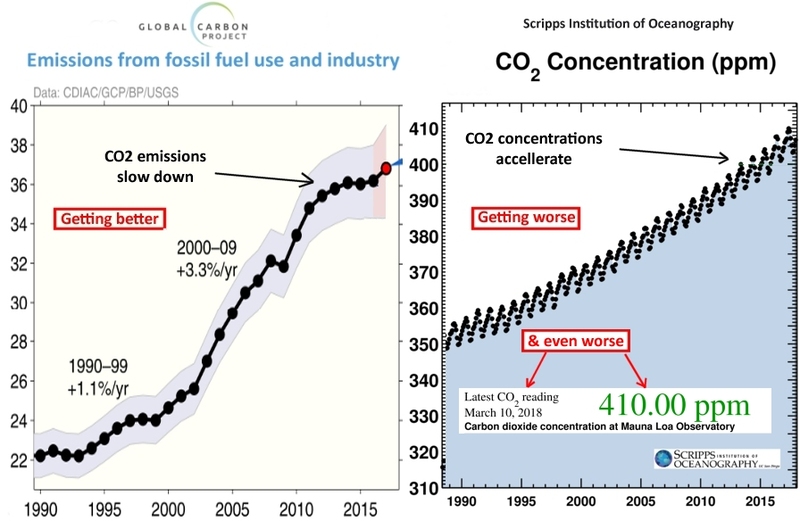 However, to have some figure in mind, let’s assume a target for remaining carbon budget of 100 tonnes CO2 to keep below 2°C. (2°C is goodbye to Tuvalu). This leaves the question: How can we devise lifestyles that can cause less than 100 tonnes of CO2e to be emitted over the next 40, 50 or 60 years. If the carbon extraction safety zone can be reached in 40 years the target is 2.5 tonnes per year. If it’s reached in 50 years the target emissions become 2 tonnes a year. For the purposes of the UK Climate Change Act (2008), UK greenhouse gas emissions are measured on a production basis: they are measured as the emissions made within the UK. Closing steel production in the UK cuts the UK’s production carbon emissions. However, the emissions caused by UK consumption does not fall because UK steel is replaced by imported imported steel: Measured on a consumption basis, UK carbon emissions have not been falling. There are several other complications to measuring per capita carbon emissions but to pick some numbers for yearly emissions: 10 tonnes CO2e for production emissions and 20 tonnes for consumption emissions are plausible. Put simply: If the rest of the world had consumption emissions like the UK the 2°C remaining carbon budget would be exhausted within 5 or six years of the UK’s consumption. For the purposes of this post, emissions from developed economies like the UK are of less interest than the emissions from the elements “modern” living. It is these that are of interest in designing a low carbon lifestyle. There is plenty of room for argument about carbon counting methodology but here are some reasonable estimates of the CO2 emissions for some of our everyday activities. (2) This uses the average personal consumption of beef and lamb in the UK from Comparing carnivores: UK meat consumption multiplied by the carbon intensity of beef from the Green Ration Book. A recent article by George Monbiot, Warning: your festive meal could be more damaging than a long-haul flight, reports a paper which gives the carbon intensity of a kilogram of beef protein as 643 kgs. As 27% of ground lean beef is protein, this gives a carbon intensity of this ground beef as at least 173 kgs CO2e for a kilogramme of beef. This means eating a kilogram of lean beef a week for 10 years creates 90.0 tonnes of CO2e. Even this may be an underestimate if methane has been rated over 100 years. From now until the carbon extraction safety zone may be 4, 5 or 6 decades, so the figures in the table for one decade would be multiplied by 4, 5 or 6 – if emissions were to continue at similar rates. Some of the sample activities shown above can, by themselves, bust the 100 tonne budget for a 2°C rise. 1.5°C? Some hopes. Worse still, official sources say billions of people will move into cities in the next few decades. Building urban infrastructure with bricks steel, concrete and tarmac causes very large emissions of greenhouse gasses. In The carbon cost of achieving low carbon lifestyles, I estimated that the carbon emissions from constructing the urban infrastructure for an extra city dweller was of the order of 100 tonnes CO2e, about equal to the personal carbon budget that remains for the 2°C rise in global temperature. To avoid catastrophic climate change, cities will have to be rather different. Pick any numbers you want, climate and carbon emissions are worse than you think.